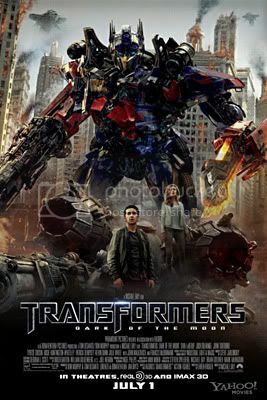 Michael Bay’s latest installment of the Transformers franchise sees Sam Witwicky (Shia LaBeouf) attempting to do what all college graduates do – find a job, and find a purpose in life. After all the excitement he’s been through with the Autobots, he finds a desk job dull and longs to do something that really matters. He has a new girlfriend, Carly (Rosie Huntington-Whiteley – a very posh Brit name, I have to say), and frets over the fact that she is more successful than he is and has a rather too-charming boss, Dylan (Patrick Dempsey). Meanwhile, the Autobots are busy helping humans “protect themselves” by going on covert missions to nuclear bases in the Middle East and in Eastern Europe with Lt. Col. Lennox (Josh Duhamel) and his men. Optimus Prime (Peter Cullen) is furious when he realises that humans have kept something from them – that something being the fact that when Apollo 11 landed on the moon, the astronauts discovered the remains of a crashed alien ship. The ship was the Ark, the last ship to escape war-torn Cybertron, and it was carrying something that could have helped the Autobots win the war. The Autobots go to the moon and retrieve the remainder of the ship’s cargo and its captain, Sentinel Prime (Leonard Nimoy! ), also the former leader of the Autobots. Sam discovers that the Decepticons are back in full force, this time manipulating people and killing off those related to the space missions. He finds that the Ark‘s captain has been the Decepticons’ target all along. However, his understanding turns out to have been a little skewed and in a rather abrupt about-face, Sentinel Prime proceeds to turn against the Autobots, revealing that he had actually made an alliance with Megatron way back when in order to ensure the continuation of their kind and their planet. The Ark‘s cargo were hundreds of “Pillars,” a sort of transporter technology that was invented by Sentinel Prime and that could only be used by Sentinel Prime. It is their plan to bring the other Decepticons, lying in wait all this time on the moon, and the entire planet of Cybertron to Earth and use Earth’s resources – in terms of material and human slaves – to rebuild the planet. To cut a long story short, the Decepticons take over Chicago, and wreak havoc there. Dylan takes Carly as a sort of hostage to make sure Sam does as the Decepticons say. They almost manage to bring Cybertron into Earth’s space, but the Autobots, Sam and Co. manage to rescue the girl, foil the plan and all is well again. I’m not quite sure what to make of Dark of the Moon – which I prefer to call “TF3” – because although I think the story here is better than in the second Transformers movie, Revenge of the Fallen, I didn’t find the action sequences particularly great. I disliked the weird stuff in TF2 about Sam dying and receiving a message from the Primes and whatnot. That sort of thing tends to come across as a bit of an easy way out or as a weak attempt at being “deep.” Fortunately TF3 did not try to do that. I liked how they used the Apollo 11 moon landing as the basis for the story’s catalyst, and I liked that they showed Sam’s frustrations at the difficulties of finding a job and being reduced to a relatively minor job in a mailroom whilst his Autobot friends go off on exciting missions and he matters no more. The action in TF3 was spectacular from a technical point of view – nothing less from ILM – and there was a lot for people who are at least a little acquainted with the process of visual effects production to appreciate. (Yes, I spent quite a bit of time pondering things like raytracing, rigging, and how these Transformer movies are either a matchmover’s dream challenge or project from hell.) But buildings falling to pieces and robots fighting robots aren’t that intriguing unless the whole setup or the fight choreography is interesting and it simply did not feel like there was enough of that “artistry” to make the fights and the exploding objects really interesting. The opening of TF3 was not to my liking at all. I understood the need to set up the backstory for the rest of the film, but I did not like the techniques applied. Specifically, how they intercut old news footage from the 1960s with new footage shot specifically for that part. The switching between the black-and-white and colour, the very grainy and the less grainy… it all did not look good, in my opinion. Would have been better if that whole part had been made to emulate the old news clips – black and white, with video grain. Despite my complaints, TF3 is fairly watchable if you go into the cinema expecting some action and amusement. The script was not as witty as it could have been, but this story makes more sense that TF2 did. Michael Bay makes full use of ILM’s talents and the result is a visual feast of machines and mayhem, especially in the second half. But should there be a fourth movie? Maybe not. Or at least not until they come up with a really good, strong story. Kind of hard to do a 4th movie, I think, since they killed off quite a lot of bots? Then again I’m not a fan… so… I wouldn’t know if any of those were important or not. haha. I had quite a few “huh? Why so weird one…” moments during the show. I didn’t like how starscream got destroyed. To be honest I felt the 2nd film has way better action than the third instalment. There’s so little bot action in the 3rd movie and way too much humans running around exploded buildings.